A set of representative selections from the Neo-Latin works of New Spain for the Latin classroom. This pioneering text presents four prose writers—Acosta, Columbus, Cortés, and Salazar—and two epic poets—Landívar and Cabrera—whose works present the Europeans' first views of the land that would become New Spain and trace the development of the preconquest Tenochtitlán into Mexico City. These authentic selections from the New World offer students who have completed their initial Latin grammar studies a special view of the full legacy of Latin literature. As anyone who teaches Latin knows, the relevancy problem becomes more acute each year, as students continue to ask why they should care about a language and culture that is becoming increasingly removed from their own. In one sense, Neo-Latin can offer a partial solution, in that it is anchored in cultures that are closer in time to ours, but when we move away from the handful of acknowledged first-tier authors who wrote in Latin to the thousands of obscure writers who populate the Neo-Latin archive, the relevancy problem returns in a slightly differ- ent way. A number of scholars like Edward George have proposed an interesting solution to this problem, by reminding us that many of the key documents in the encounter between the so-called old and new worlds were written in Latin, and others like Andrew Laird have also produced editions and studies of some of the texts that were written in Latin by people in the western hemisphere who had been trained in the languages and cultures of Europe. Rose Williams has done Latin teachers a great service by collecting some of these texts together for classroom use. The Viceroyalty of New Spain was the first of four that were established to administer the colonies that Spain founded overseas; at its widest extent, it covered Mexico and central America minus Panama, most of the United States west of the Mississippi along with Florida, and the Spanish East and West Indies, governed by a viceroy in Mexico City. The first selection is taken from the writings of José de Acosta, who reported back to Spain about how the lands and peoples of New Spain differed from European preconceptions about them. Next comes a selection from Francisco José Cabrera’s epic poem Monumenta Mexicana, which explains the legend of the expelled and returning king that retained a firm hold in Mesoamerican religion. Rafael Landívar’s epic Rusticatio Mexicana in turn discusses the founding of the cities that were built in Lake Texcoco, a unique feature of early Mexico. Christopher Columbus's Epistola de insulis nuper repertis gives his impressions of the simple, peaceful peoples he found in the Caribbean islands and of the land in which they lived. Hernán Cortés’s Praeclara Ferdinandi Cortesii de nova maris oceani Hyspania narratio describes Tenochtitlán, the Aztec capital that was populated by people who were anything but simple and peaceful, while Francisci Cervantis Salazari Toletani, ad Ludovici Vivis Valantini exercitationem, aliquot dialogi presents a teaching dialogue composed by Francisco Cervantes de Salazar, who discusses Mexico City, which Cortés had recently built on the remains of Tenochtitlán. The book is intended to be accessible to students who have some background in intermediate Latin. Each text is introduced by a brief biography of its author and accompanied by vocabulary, grammar and word use questions, and comprehension queries on facing pages. Five appendices cover background notes on significant persons, places, and terms; a historical timeline; common figures of speech; rhythm and meter in poetry; and a master list of neologisms, which are also pulled out on the facing pages so that they do not confuse students who have been trained in classical Latin. An extensive Latin-to-English glossary and a short bibliography complete the book, which is nicely illustrated as well. Latin of New Spain will obviously be useful in a traditional undergraduate Latin sequence in which the teacher is looking for something interesting with which to challenge the students, but it seems to me that the range of potential users is unusually wide. There are enough usage aids to make the book a possibility for high school classes, but I could also see it being used in graduate courses like the colonial of- fering in a department of Hispanic Studies, where students could be reasonably expected to have some Latin but not to be able to plough through long texts without help. In other words, this is a book whose appearance is unusually timely and welcome, offered at a bargain price. The rich and copious legacy of Latin writing from Spanish America is at last becoming better known. 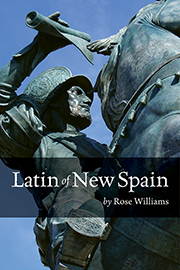 Rose Williams' teaching anthology seeks to bring this literature to the attention of non-specialists by making excerpts from some texts about New Spain available to those who have "some background in intermediate Latin" (ix). The unadapted readings from original sources in each chapter are introduced with a short account of their context and an introductory synopsis. Each reading is followed by an extensive vocabulary and a list of the "neologisms" it contains (the Glossary at the end presents all the Latin words), and by questions about its content and significance, as well as about grammatical and linguistic matters. This helpful arrangement should enable students to produce satisfactory translations and elucidations. The book is divided into two main sections. The first, "Before the Europeans," includes two chapters with testimonies on the geography of the New World and the origins of its peoples from the De procuranda indorum salute (1588) by the Jesuit missionary José de Acosta; a chapter on the Quetzalcoatl legend, as recounted in Latin hexameters by the twentieth-century Mexican poet Francisco J. Cabrera; a third chapter containing an account of the origins of the Mexica (or "Aztecs") and the foundation of Tenochtitlan, again by Cabrera, as well as poetic descriptions of the organisation of the city before the Spanish conquest that are drawn from the Rusticatio Mexicana (1782) by the Jesuit Rafael Landívar. The second main section, entitled "The Coming of the Hispanics," is devoted to the European discoveries and incursions, with extracts from the early Latin versions of the letters of Christopher Columbus and Hernán Cortés, and an account of Mexico City from Civitas Mexicus interior, one of a group of dialogues published there in 1554 by Francisco Cervantes de Salazar. Latin literature was produced in every part of the Americas, but the volume's focus on "New Spain" (as Mexico was known) makes sense: the viceroyalty early on secured its status as an intellectual centre after the introduction of printing and the foundation of the Royal University in the mid-1500s. Rose Williams has arranged the Latin texts she has selected in the order of their subjects, rather than in the order in which they were actually written. Had this been a historical sourcebook, a couple of passages about pre-conquest Mexico from Peter Martyr's De orbe novo might have been preferred to the later poetic material offered here, as the Italian humanist closely followed firsthand accounts. The verse readings from Landívar and Cabrera, though, have their advantages. Alone of all the colonial Latin poets, Landívar could be deemed canonical, as his work barely ever disappeared from view in Mexico or in his native Guatemala, while the epyllia on Mexican themes that Francisco Cabrera composed in the 1990s now have enthusiastic devotees in the United States as well as in Mexico. Cervantes de Salazar is an appropriate inclusion in a collection like this because, as Rose Williams points out (168), his dialogues were originally aimed at students of Latin: in fact they were part of the first Mexican printing of Juan Luis Vives' pedagogical Linguae latinae exercitatio. Overall, the selections in Williams' volume should sustain the interest of its intended readers as they develop their comprehension of Latin. Latin was generally the preserve of an elite—of peninsular Spaniards and "creoles," as American-born Spaniards have come to be known. But some youths from the native Mexican nobility did receive an advanced Latin education at the Imperial College of Santa Cruz de Tlatelolco, which was established in 1536 specifically in order to train an indigenous gubernatorial class. In spite of its focus on the sixteenth century, Latin of New Spain makes no mention of this extraordinary development, or of the work produced in this period by "Indian" Latinists. The anthology could have been enhanced by the incorporation of examples from their writings, such as Juan Badiano's Libellus de medicinalibus indorum herbis (1552) or Antonio Valeriano of Azcapotzalco's letter to Fray Juan Bautista. The Latin passages in the book are clearly and correctly presented, although the Background Notes contain some errors: the Spanish for college is colegio, not collegio (164, 206); the Aztecs' rivals from the city of Tlaxcala are known as Tlaxcaltecs or Tlaxcalteca, not "Tlaxcatlecans" (210). While the important distinction between Tenochtitlan and Teotihuacan is earlier made very clear (205), the heading ‘Tenochtitlán or Teotihuacan' (213) suggests that these two very different cities were the same. (The final syllables of both those names should be accented here and throughout, if Spanish accentuation for Mexican names is being adopted consistently). The Spanish for plinth, which is also a customary word for city square, is zócalo, not solako (214). Williams defends her persistent reference to the Spaniards as "Hispanics" on the grounds that Spain was unified only in 1516 (xi). Even so, soldiers, settlers and missionaries from the Iberian peninsula are generally called Spaniards or Castilians, and they thought of themselves as such. A project of this kind is a good idea, now that there is a growing recognition of the extent to which Latin humanism and classical learning took root in Spanish America and Brazil, long before any such legacies reached the northern continent. At the same time, some will take issue with the potted history in the Introduction (xv-xvii) and the tone of the Epilogue, headed by the Heraclitean dictum "Everything changes…" (186). The brutal realities of conquest and the inequities of colonial rule should not be downplayed or ignored. Nonetheless, Rose Williams' orientation will open up a new world of Latin literature to a larger number of readers, and it may well make study of the Latin language more appealing to students who would like a change from the usual fare of Caesar and Cicero.